Learn how to make deviled eggs with this easy recipe. 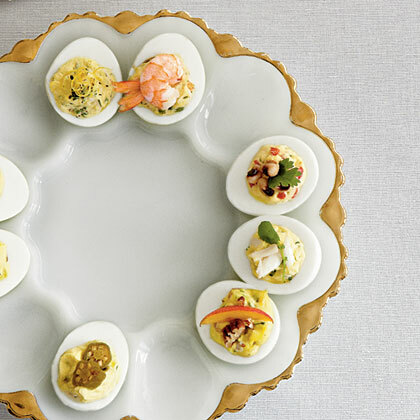 Take your deviled eggs to the next level with creative additions such as bacon, shrimp, chives, crabmeat, pecans and pimiento. Creole Shrimp: 1/2 cup finely chopped cooked shrimp, 3 Tbsp. sautéed chopped green bell pepper, 1 minced green onion, 1/4 teaspoon Creole seasoning, 1/4 teaspoon hot sauce. Top with cooked shrimp. Texas Caviar: 3 Tbsp. chopped roasted red bell pepper, 1 minced green onion, 1 Tbsp. minced pickled Jalapeño pepper, 1 Tbsp. chopped fresh cilantro, 1 teaspoon Italian dressing mix. Top with canned black-eyed peas and fresh cilantro leaves. High Society: 1/2 cup cooked fresh lump crabmeat, 2 teaspoon fresh tarragon, 1/2 teaspoon lemon zest, 1/4 teaspoon pepper. Top with cooked fresh crabmeat and watercress. Georgia Peach: 3 Tbsp. peach preserves, 1/4 cup finely chopped country ham, 1 teaspoon grated Vidalia onion, 1/2 teaspoon apple cider vinegar, 1/4 teaspoon pepper. Top with sliced fresh peaches and chopped toasted pecans. 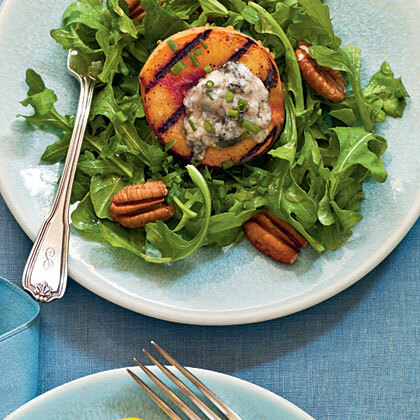 Gorgonzola cheese gets gooey and delicious melted over the grilled peaches in this amazing summer salad recipe. There’s a perfect balance of salty and sweet goodness.